Naoya Inoue stops Juan Carlos Payano in the opening round. Photo credit: World Boxing Super Series. 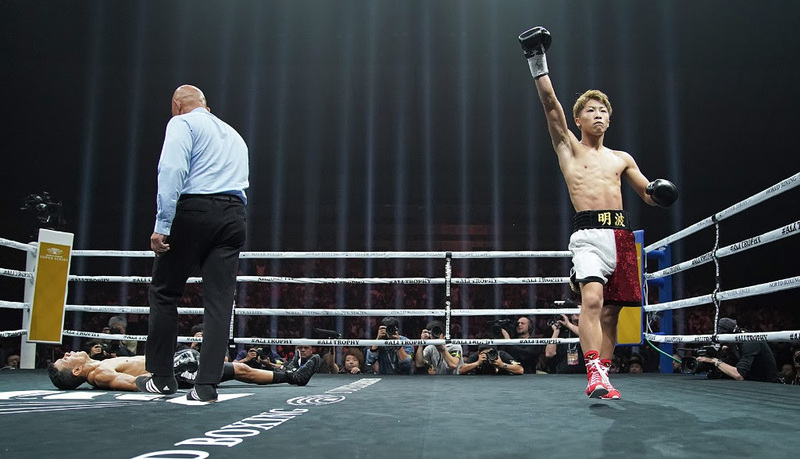 Boxing prodigy Naoya ‘The Monster’ Inoue 17-0 (15) proved why he is the favourite to win season two of the World Boxing Super Series (WBSS) with a 70 second knockout of experienced southpaw Juan Carlos Payano 20-2 (9) at the Yokohama Arena in Yokohama, Japan on Sunday night. “I am going for the KO, I am going to finish him,” the 25-year-old former three-division world champion boldly predicted before the fight. Good to his word Inoue rolled through Payano, slamming home a lightning quick left-right combination that put paid to the Dominican’s world championship aspirations. Inoue was making the first defence of the WBA ‘regular’ title he annexed from England’s Jamie McDonnell in Japan last May. He previously held the WBO super flyweight title and the WBC junior flyweight world titles. The 34-year-old Payano is a former bantamweight champion. He won the WBA Super title from Anselmo Moreno in 2014 and lost the title two years later to Rau’shee Warren by majority decision. That fight was a rematch of his split decision win over Warren 10 months earlier. The Inoue-Payano fight was one of the quarterfinal bouts in the WBSS. Inoue will now face the winner of the IBF bantamweight title fight between champion Emmanuel Rodriguez of Puerto Rico and challenger Jason Moloney of Australia scheduled to take place in Orlando, Florida on October 20. The other quarterfinal bouts on the other side of the bracket feature WBA Super champion Ryan Burnett of the United Kingdom against Filipino former multi-division champion Nonito Donaire in Glasgow, Scotland on November 3 while WBO 118-pound champion Zolani Tete of South Africa will defend his title against Russian novice Mikhail Aloyan at Ekaterinburg Expo in Ekaterinburg, Russia on October 13.